It's pretty sad when you take pictures of fake landmarks when you already saw the original. 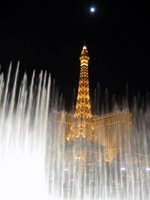 Kelly's favorite thing in Vegas was the fountains at the Bellagio, so on our last night here we went to see them one more time. At night there's a show every fifteen minutes so we hung around for a couple. The first time we watched it from the hotel side, facing the Paris casino. It's a cool little show. 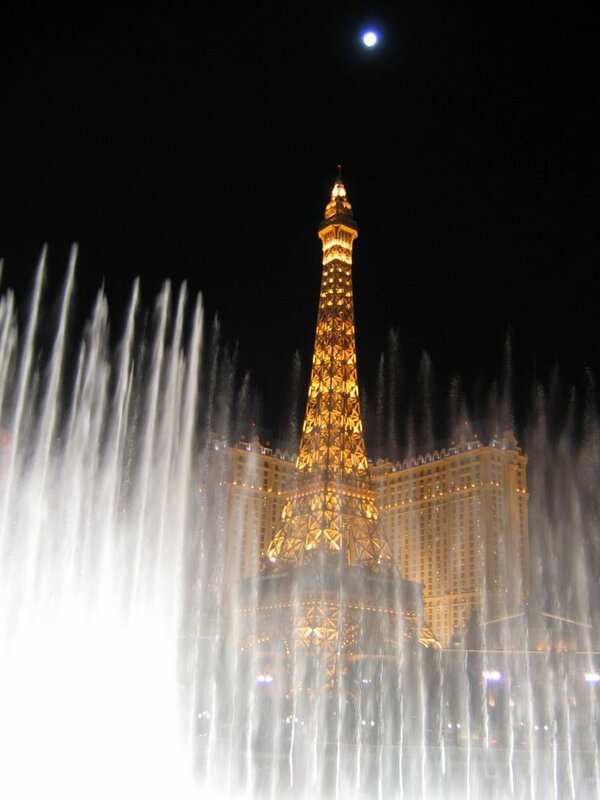 It's amazing how people will clamor over lighted fountains. Maybe that's the kind of thing they should try at Fountain Square. This was a great mini-vacation, one "last hurrah" before the little girl arrives. We knew about this trip since Christmas, so I still don't feel like I've started the new year yet. But I'm rested and I'm ready to hit things hard when we get back to town. We have a full day tomorrow: preaching for the last time out at Amelia and Echo tomorrow night, so I'd better be ready. We're sitting in the airport now, an hour and a half before our flight leaves [By the way, props to McCarran Airport for free wi-fi. Cheap old CVG makes you pay]. We're on a three-hour time difference, so we'll have to get back in sync with Cincinnati time, but after the jet-lag we felt from our Israel trip, this should be a piece of cake. Quoting the brilliant philosopher, "Mama, I'm coming home."